The man known as Burning Spear was born Winston Rodney at St Ann's Bay, Jamaica in 1948 and his unusual name for the duo he formed in the late 1960s comes from Jomo Kenyatta, the Mau Mau leader who eventually became the president of Kenya – his Christian name means 'Burning Spear' in English. Having first recorded in 1969, Burning Spear's first album to make significant waves was the brilliant Marcus Garvey in 1975 – for many it is Rodney's masterpiece and the seminal album for what has become known as dread roots. Besides the title track the album also includes the superb 'Slavery Days', and both received strong airplay in America. It was followed by Man in The Hills – equally impressive – along with Garvey's Ghost and Social Living before the 1970s were over. Shortly before the release of Social Living, Winston Rodney toured the UK for the first time using Aswad as his backing band. By the 1990s Burning Spear, unlike some other reggae artists, was staying true to his roots and Mek Me Dweet and the hypnotic Jah Kingdom, his last album for Island's subsidiary, Mango, is, if anything, even better than the previous album. Rodney as a follower of Rastafarianism has used his music to explore, as well as spread the word of his faith. Born in St. Ann's Bay, Jamaica, in 1948, it was another St. Ann's native, Bob Marley, who set Rodney off to Kingston and a fateful meeting with Studio One head Coxsone Dodd. Although the Wailers had departed the label three years earlier in 1966, Marley still believed that it was the best place for a new talent to start. Rodney took his advice and, with singing partner Rupert Willington in tow, auditioned three songs for the producer. Dodd immediately picked one, "Door Peep," as the pair's debut. Before its release, however, Rodney chose the name Burning Spear for the duo. It was a moniker heavy with history and had formerly been bestowed upon Jomo Kenyatta, the Mau Mau leader who eventually became the president of Kenya. Soon after "Door Peep" landed in the shops, Burning Spear expanded to a trio with the enlistment of Delroy Hinds, brother of "Carry Go Bring Come" Justin. It was with this line-up that Burning Spear released a series of singles on Studio One, including the 1972 Jamaican smash hit "Joe Frazier (He Prayed)." 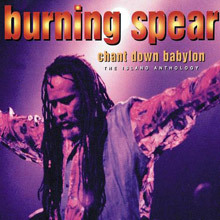 The following year brought the group's debut album, Studio One Presents Burning Spear, with Rocking Time coming hard on its heels in 1974. These records only hint at what was to come, even if the group had early on established their own unique sound with Rodney's chanted vocals the focus and Willington and Hinds providing sweet accompaniment. Rodney's lyrics were pregnant with emotions, righteous anger at oppression, but aglow with a deep sense of spirituality. The early song titles speak for themselves -- "Ethiopians Live It Out," "Zion Higher," "We Are Free" -- all obviously revolving around the cultural themes of oppression, repatriation, and religious devotion, but their power was somewhat stunted by the typical Studio One arrangements. However, Burning Spear could count themselves lucky, for at least Dodd was releasing their recordings. During this same period, the producer was letting the Abyssinians rot rather than chance releasing their plaintive and devotional songs. Understandably then, over time Burning Spear would revise many of the songs first cut at Studio One and they'd all gain mightily in atmosphere via the new arrangements and production. More singles followed, but the trio seemed unable to repeat "Joe Frazier"'s success; in 1975, they split with Dodd and joined forces with producer Jack Ruby. Their initial session produced immediate results; "Marcus Garvey," meant for sound system play only, was so successful that Ruby was forced to release it as a single. Its follow-up, "Slavery Days," proved its predecessor was no fluke. Inevitably, Dodd sought to take advantage of his former trio's new-found popularity and released a clutch of singles in response, taken from Spear's earlier sessions with him. Meanwhile, the group began recording their next album with Ruby and accompanied by the Black Disciples, a phenomenal studio band featuring some of the island's greatest musicians. The end result was the Marcus Garvey album, one of the greatest Jamaica has ever unleashed. Its heavy roots sound, dreamy, haunting atmospheres, and powerful lyrics capture the imagination and never let go. It was after the album took Jamaica by storm that the Island label stepped in and signed Burning Spear. However, they immediately outraged the trio by remixing the record for white consumption. An equally light dub mix, Garvey's Ghost, was a weak attempt at a peace offering and did little to soothe Rodney's fury. To ensure that he maintained control in the future, the singer now set up his own label, Spear, debuting it with the single "Travelling," a new version of the old Studio One cut "Journey." Two more singles, "Spear Burning" and "The Youth," swiftly followed. 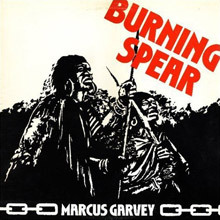 In 1976, Burning Spear released their successor to Marcus Garvey, Man in the Hills. Again accompanied by the Black Disciples and overseen by Ruby, much of the album revolved around rural themes. The set also boasts an impressive new version of the group's debut release, "Door Peep," and the stunning club hit "The Lion." An excellent dub version, remixed by Sylvan Morris, accompanied the album. By the end of the year, however, Rodney had broken not just with Ruby but with his two bandmates. Retaining the Burning Spear name, the singer now set out on his own and self-produced his next album, Dry and Heavy. Recorded at Harry J's studio and with the Black Disciples still in tow, the singer laid down an album awash in sound, with the musicians contentedly jamming between the songs' verses. Once more he revisited a number of older offerings, including "Swell Headed," reinvented as "Black Disciples." Sylvan Morris was again asked to remix a dub companion. By now, Burning Spear had amassed a sizeable following in the U.K. and in October of 1977, Rodney made his first appearance in the country, backed by the local reggae band Aswad. A ferocious show at London's Rainbow Theatre was captured for posterity on the Live album. For 1978's Social Living, Rodney made some changes. the Black Disciples remained at his side, but were buttressed by members of Aswad. The singer brought in Karl Pitterson to co-produce with him, while recording was split between Harry J's and Compass Point in the Bahamas. The end result was a scintillating album that mixed jazzy stretches with deep roots and anthemic reggae, notably on the single "Civilized Reggae." Sylvan Morris' dub mix was released the next year. The year 1979 was a momentous one, as Rodney took a leading role in the seminal Rockers movie; his a cappella performance of "Jah No Dead" was one of the film's standout moments. The singer had appeared at the inaugural Reggae Sunsplash the year before, and was invited back again that year, in 1980, and he appeared regularly throughout the rest of the festival's history. His relationship with the Island label came to an end and Spear, too, folded with its final release of Burning Spear's own "Nyah Keith." As the new decade dawned, Rodney launched the Burning Spear label, and signed it to the EMI label. But the singer hadn't cut all ties with his past and he recorded his new album, Hail H.I.M., at Bob Marley's Tuff Gong studio with Black Disciple and Family Man Barrett co-produce it. Sylvan Morris was again engaged to remix a dub version. These five studio albums, starting with Marcus Garvey, remain a seminal canon of dread roots, a string of recordings so strong that no other artist in the field has equalled them. They remain a fiery legacy, not just of the artist, but of the time. In 1982, Rodney inked a deal with the Heartbeat label in the U.S., and recorded his debut album for them, Farover. The album featured a new backing group, the Burning Band, and it was apparent that the artist was now entering a new musical era. While Farover remained suitably steeped in roots, for the first time Rodney was beginning to seriously explore non- cultural themes, a shift the "She's Mine" single drove home. The Fittest of the Fittest continued down this path the following year, but there was more sparkle found on 1985's Resistance, which was nominated for a Grammy. That was Burning Spear's final album for Heartbeat and Rodney next signed a deal with the independent Slash label. His debut for them, People of the World, earned another Grammy nomination. Its follow-up, 1988's Mistress Music, suffered from poor production, but better was the Live in Paris: Zenith album recorded at a show in May and released the same year. Running through a set of greatest hits, the album garnered another Grammy nomination, but saw the end of the Burning Band, which dissolved upon the completion of Burning Spear's European tour. Two years later, Rodney was back with a new backing group and incredibly re-signed to Island, opening his account for them with Mek We Dweet. By now, Burning Spear was recording the kind of consumer friendly roots Island had always wanted. The album, while a simmering blend of jams and jazz, pop, and reggae lite, was far removed from the artist's seething early work for the label. However, Rodney's stagework remained ferocious and American audiences were treated to some stunning live performances at the Sunsplash U.S. shows. Odd as it may sound, the artist was asked for a track for Deadicated: A Tribute to the Grateful Dead, a Grateful Dead tribute album. His version of "Estimated Prophet" was less a tribute to the kings of psychedelic jams, than a simmering tribute to classic roots. 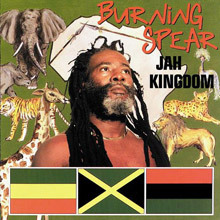 That album appeared in 1991, the same year as Burning Spear's own Jah Kingdom, which while as light as its predecessor, contains a remarkable hypnotic atmosphere. After its release, Rodney once again severed his ties with Island and moved back to the Heartbeat label. 1993's The World Should Know, another Grammy-nominated album, inaugurated the new partnership and was cemented the following year with Love and Peace: Live 1994. The live album features some of Rodney's most ferocious recordings in years, and it was now on-stage that the artist was arguably delivering his best work. Burning Spear toured constantly, and successfully, across the decade, to the detriment of recording time. Still, the artist continued to release albums on a biannual basis, beginning with Rasta Business in 1995, it too earned a Grammy nomination. As did Appointment with His Majesty, which saw Rodney experimenting with a distinctly folky sound. However, always a bridesmaid but never a bride, it seemed the artist was destined to be the eternal also-ran at the Grammys. That changed in 1999 when Calling Rastafari finally garnered the trophy. It was a deserving win; the album, moodier and more introspective than anything since the early crucial five, simmers across the grooves and many of the tracks have an unexpected sharpness to the lyrics. The album was supported by a major American tour. Spear started his own record label, Burning Spear Records, and released Freeman in 2003, followed by the hopeful Our Music in 2005. Major label rivalry makes it unlikely that Burning Spear will ever receive a proper career retrospective set. Burning Spear signed to Island Records in 1976, debuting with the legendary Marcus Garvey album, accompanied by its dub companion Garvey's Ghost. Four new albums followed before Spear departing Island for the U.K. EMI label in 1980. A decade later, Burning Spear returned to Island for two new albums before their relationship again soured. (The situation is even more complex in the U.S., where Spear releases have been split among the Island, Heartbeat, and Slash labels.) The result of all these label relocations makes for a rather odd anthology indeed, which inevitably omits Spears' entire 1980s output, five albums in all, including the Grammy-nominated trio of Resistance, People of the World, and Mistress Music. Obviously, post-1992 material is also missing, including anything from the Grammy-winning Calling Rastafari. That's what you don't get. What you do get is a double album of some of Spear's most seminal work. The five albums released between 1975 and 1980 are all considered masterpieces, comprising a roots series that remains unparalleled. Of course, the fifth, Hail H.I.M., was not an Island release, but you do get selections from the other four. Of Babylon's 35 tracks, 20 are culled from Marcus Garvey, Man in the Hills, Dry & Heavy, and Social Living, the first four albums in this seminal set. Others also date from this period: a track from Garvey's Ghost; "Man in the Hill"'s B-side, "Cultivation"; "Jah No Dead," Spear's contribution to the Rockers soundtrack; "The Lion," taken from 1977's Live album; a previously unreleased "Jordan River," recorded live around the same time; and a non-album track culled from 1979's Harder Than the Rest compilation. The remainder are pulled from Spear's early-'90s albums, the Grammy-nominated Mek We Dweet and Jah Kingdom. The latter album included Spear's contribution to the Grateful Dead tribute album, Dedicated, a simmering "Estimated Prophet," which also appears here. Only the most persnickety fan could complain about Babylon's selections, which boast all of these albums' strongest songs. However, the musical leap between tracks five and six on disc two, which chronologically jumps a decade, remains disconcerting, but there's no avoiding it, bar squeezing the early material onto disc one. So, while not a definitive career compilation, this anthology is probably the best fans can hope for. This 1979 compilation collects together some of the finest records that Burning Spear made for the Island label. a great place to start your exploration of his superb catalogue. After gaining exposure with producer Clement Dodd between 1969-1975, Burning Spear (aka Winston Rodney) and singing partners Rupert Willington and Delroy Hinds cut a handful of stunning albums for Island over the next three years. The first two releases, Garvey's Ghost and Man in the Hills, were produced by Jack Ruby and introduced Jamaicans and eventually a much wider audience to the trio's stark mix of rasta/social themes, chant-like vocalizing, and sophisticated take on the islands' raw nyabinghi drumming tradition. The next two studio albums, Dry and Heavy and Social Living, were produced by Rodney and maintained the group's cultural stance while also sporting a slicker sound, thanks in part to some jazz-tinged horn arrangements. This roundup includes highlights from these releases, plus one track from the dub version of the Marcus Garvey LP, "Garvey's Ghost." And while the expansive and somewhat more accessible sound of later tracks like "Throw Down Your Arms" and "Social Living" might stand out at first, early bedrock cuts such as "Marcus Garvey" and "Slavery Days" remain the most compelling numbers here. Featuring such Jamaican studio luminaries as the Barrett Brothers, Sly and Robbie, Leroy "Horsemouth" Wallace, Vin Gordon, Bobby Ellis, and Earl "Chinna" Smith, Harder Than the Best qualifies as a solid introductory disc for the curious listener. 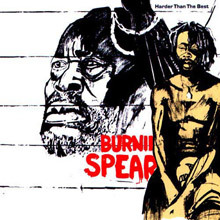 Burning Spear (a.k.a. Winston Rodney) spent most of the '80s bouncing between labels after establishing himself thanks to a string of legendary '70s albums released on Mango Records. The early '90s found Spear back with Mango and 1991's Jah Kingdom was the last album he released on this Island Records offshoot before returning to indie label Heartbeat. Man in the Hills is a reggae album by Jamaican musician Burning Spear (Winston Rodney), released in 1976 (see 1976 in music) on Island Records. Man in the Hills was follow-up to the seminal Marcus Garvey; Man in the Hills is usually considered a worthy follow-up, though less innovative and incendiary. produced by Jack Ruby, Man in the Hills is a simple and unadorned album, with songs that reminisce about Spear's childhood in St. Anne's Bay, Jamaica. "Door Peep" was originally recorded in 1969 at Studio One after Spear ran into Bob Marley (also from St. Anne's Bay); Spear later quotes Marley "And Bob was going to his farm. The man was moving with a donkey and some buckets and a fork, and cutlass and plants. We just reason man-to-man and I-man say wherein I would like to get involved in the music business. And Bob say, 'All right, just check Studio One.' " The single was released but fared poorly on the Jamaican charts. After Marcus Garvey, Spear's fame had grown considerably, and he was a star in Jamaica and cult sensation in the United Kingdom. Man in the Hills was a much quieter and more restrained album than its predecessor, and was more astoral and dreamlike than militant and radical (though songs like "Is It Good" and "No More War" continue to address social issues). 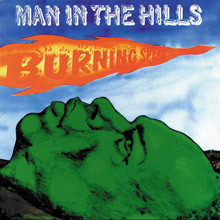 "Man in the Hills", the titular album opener evokes the superiority of rural living over urban. In Jamaican history, the roots of radical protest, a national identity and the Rastafari movement, grew from communities formed by escaped slaves in the hills and (after emancipation in 1838) the so-called "Free Villages". One of the finest and best-selling reggae singers of the 1970s, Burning Spear (aka Winston Rodney) successfully entered the '90s with Mek We Dweet. Though not quite on a par with such '70s gems as Marcus Garvey and Man in the Hills, Dweet proved that Spear could still deliver a thoroughly satisfying album. 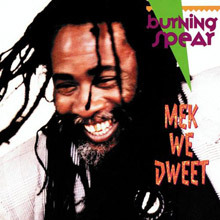 In contrast to reggae singers who, in 1990, were incorporating heavy doses of dancehall, Spear wisely sticks with the type of earthy, simple reggae that earned him so devoted a following in the '70s. 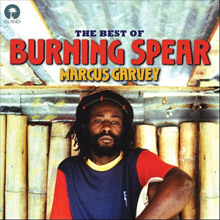 Cuts like "Elephant," "Garvey" (one of his many odes to Marcus Garvey), and "My Roots" aren't much different from what Spear was doing 15 years earlier and leave no doubt that he was intent on remaining true to himself. 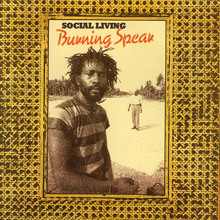 Social Living picks up where the third Burning Spear LP, Marcus Garvey, left off -- more slow, dark songs about slavery, repatriation, and, of course, Garvey himself (four of the nine songs have his name in their titles). There are still no real tunes to speak of, just immensely dense grooves that thud and rumble along slowly and relentlessly to the accompaniment of distant horns and rattling nyahbinghi percussion. If this 2003 remaster edges out the original Island release in any way, it's in the mix: Island toned down Social Living (aka Marcus' Children) a bit to appeal to British audiences, but the Blood and Fire version absolutely throbs with bass and echoes like drums heard across vast distances. In this context, when Winston Rodney sings that "Jah no dead" it's impossible not to believe him; when he instructs you in the specifics of "Social Living," you find yourself submitting to his instruction. It's that kind of album. Marcus Garvey is the third album by the reggae singer Burning Spear, released in 1975 on Island Records. The album is named after the Jamaican National Hero and Rastafari movement prophet Marcus Garvey. A dub version of it was released four months later as Garvey's Ghost. This was the first album by the group recorded for Island Records, whose founder Chris Blackwell had been instrumental in breaking Jamaican reggae artists Jimmy Cliff, Toots and the Maytals, and Bob Marley to an international audience. It was produced by Lawrence Lindo, better known by his handle taken from the assassin of Lee Harvey Oswald, Jack Ruby. Apparently, upon their first meeting, Lindo and vocalist Winston Rodney realized the opening track to this album, "Marcus Garvey." The backing musicians, whom Lindo named The Black Disciples band, had been assembled from The Soul Syndicate and The Wailers. One of the most distinctive and original talents in the history of Reggae, Burning Spear--ne Winston Rodney--was launched internationally with this striking album. His deep, preaching vocal is immediately arresting, a characteristic enhanced by a dense and brooding accompaniment. Taking cues from Rastafarian chants, Spear subtly builds an intensity, locking each track into a seamless whole. His knowledge of black history brings a chilling realism to the album's lyrics, resulting in what is incontestably a milestone in the development of reggae. Listening to it is an education itself. This album showcases Burning Spear's most popular and influential work dring the second half of the 1970s. His is the sound that helped to define Roots Reggae and it's all gathered here on 20 tracks that show why Burning Spear is widely regarded one of the most important performers of his generation, rivalling the very best that Jamaica had to offer.